Bloomberg reported in August 2018 that Amazon was developing and would produce a DVR. About a month later, Amazon confirmed the rumored DVR, and it is now available from Amazon. Fire TV Recast is a DVR that lets you watch and record over-the-air TV at home or on-the-go with a Fire TV, Echo Show, or compatible mobile device—with no monthly fees. Watch and record live sports, local news, late night shows, and other can’t miss TV from channels available through an HD antenna like ABC, CBS, FOX, NBC, PBS, and The CW. The lower cost model can record up to 2 shows at once, with enough storage for up to 75 hours of HD programming. With a compatible Alexa-enabled device, you can use your voice to search for shows, manage and schedule recordings, and help with other requests. Say things like “Alexa, open Channel Guide" or “Alexa, record Riverdale.” Fire TV Recast delivers the most reliable video streams over Wi-Fi of any over-the-air DVR according to Amazon. 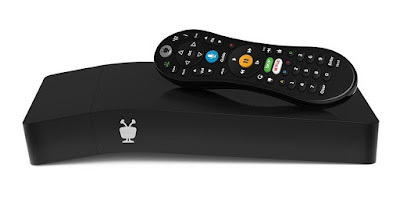 The Fire TV Recast DVR is compatible with the other Fire TV devices described below. 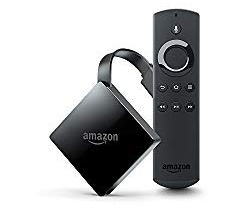 The Fire TV with 4K Ultra HD and Alexa Voice Remote is a streaming media player. You can experience true-to-life picture quality in 4K Ultra HD and HDR. It is 40% more powerful than the Fire TV Stick. It supports Dolby Atmos audio—feel scenes come to life in three dimensions. Access 500,000+ movies and TV episodes from popular channels and apps including Netflix, Prime Video, Hulu, HBO, SHOWTIME, NBC, and more. Do more with Alexa—find and control content, play music, check movie showtimes, order a pizza, and more. Just press and ask using your Alexa Voice Remote or pair an Echo device for hands-free control. Navigate millions of websites such as YouTube, Facebook, and Reddit with browsers like Silk and Firefox. Amazon Prime members get unlimited access to thousands of movies and TV episodes, plus ad-free listening to millions of songs with Prime Music. No cable or satellite? No problem. Watch live TV and sports with subscriptions to Hulu, PlayStation Vue, and Sling TV. The Fire TV Cube is the first hands-free streaming media player with Alexa, delivering an all-in-one entertainment experience. From across the room, just ask Alexa to turn on the TV, dim the lights, and play what you want to watch. With far-field voice recognition, eight microphones, and beamforming technology, Fire TV Cube hears you from any direction. Enjoy hands-free voice control of content—search, play, pause, fast forward, and more. Plus control the power and volume on your TV, sound bar, and A/V receiver as well as change live cable or satellite channels with just your voice. Do more with Alexa. Fire TV Cube has a built-in speaker that lets you check the weather, listen to the news, control compatible smart home devices, and more—even with the TV off. Fire TV Cube is always getting smarter with new Alexa skills and voice functionality. Experience true-to-life picture quality and sound with access to vivid 4K Ultra HD up to 60 fps, HDR, and the audio clarity of Dolby Atmos. Enjoy unlimited access to tens of millions of songs with Amazon Music, starting at just $3.99/month. Amazon Prime and Prime Video members can purchase third-party channel subscriptions (like Showtime, Starz) and other streaming entertainment channels directly through Prime Video. There are many other channels currently available.